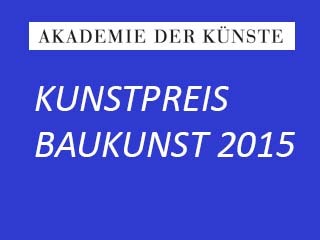 On 18th of March 2015 Achim Menges will be awarded the KUNSTPREIS BAUKUNST (ART AWARD IN ARCHITECTURE)2015 of the Akademie der Künste (Academy of Arts) by the Mayor of Berlin. The Berlin Akademie der Künste, founded in 1696, is one of the oldest cultural institutes in Europe. The Academy’s Art Prizes in each of the six art sections represented in the Academy are awarded annually on 18th of March in remembrance of the 1848 revolution. Former recipients of the Kunstpreis Baukunst include Coop Himmelblau / Wolf D. Prix and Helmut Swiczinsky (1982), Jacques Herzog and Pierre de Meuron (1987), as well as Shigeru Ban (2000).